Personally, I prefer the query syntax and find the lambda syntax a bit messy with SelectMany. Let’s try to tear this down a bit to see if we can understand what’s going on. Here we still have 3 different sets of Observables—mouseDown, mouseMove and mouseUp. The SelectMany extends mouseDown taking in the instance of each observed value as it is produced. 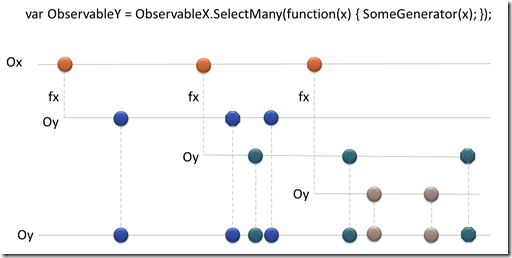 SelectMany then takes a function (lambda) which will generate a new set of Observables of some other type which may or may not include values from the first observed value and values from the second variable. In this case the Ox represents the MouseDown observables. fx represents the function supplied in the Lambda parameter and Oy represents the resulting Observable set of offsets. Wes and Jeffrey walk through SelectMany in their Channel 9 video as well. Now that we have our observables, we can merge the streams using SelectMany and subscribe to the end result to actually move the image on the screen by altering the css left and top positions accordingly. It can take a bit of mind twisting to get your head around the lambda syntax for SelectMany, but once you’ve done that, you can start doing some powerful manipulations to extend and coordinate observable event streams in both .Net and RxJs.